Don’t listen to the armchair haters. 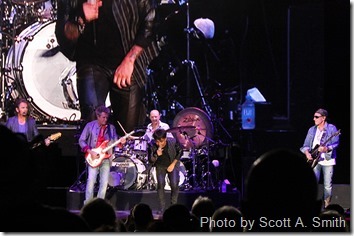 Journey rocks hard – really, really hard – in concert. Reunited with their classic-lineup drummer Steve “Machine Gun” Smith, Journey pounded the stage with a brilliant, sweaty set full of hits and gritty guitar-laced tracks for a capacity, very vocal audience May 31 at the Walmart AMP in Rogers, Arkansas. 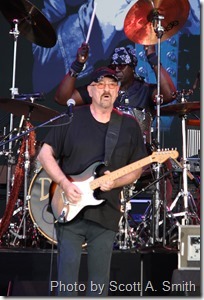 The strong gig was part of Journey’s new San Francisco Fest 2016 Tour, which also features the equally magnificent Doobie Brothers and solo artist and former Traffic member Dave Mason as opening artists. Taking the stage while the stage was partially shadowed, the members of Journey – Smith, guitarist Neal Schon, bassist Ross Valory, keyboardist Jonathan Cain and singer Arnel Pineda – hit full-throttle on the set-opener “Separate Ways (Worlds Apart),” letting Cain’s lead synthesizer line shine above the pumping rhythm and sounds of Schon, Valory and Smith. All five musicians looked and sounded like they wanted to be with each other on that stage and nowhere else. Smiles and laughs continually shot back and forth between the members, with Valory looking wide-eyed at Schon and Smith as they silently counted one arrangement’s shift in direction. The quintet’s sound was loud and the performances were rehearsed, but not overly rehearsed. The rust-free appearance never backslid into autopilot. Smith’s unique drumming took on a jazz flavor on the softer parts and moments of mid-level intensity, while Smith slipped up-gear for a more aggressive attack during the evening’s grittiest segments. “Be Good to Yourself,” a solid studio take from Journey’s 1986 LP, “Raised on Radio,” came to larger, better life inside the AMP, gaining an urgency and seeing Pineda frequently hurl through the air with Spider-Man-esque ability. Critics’ frequent target of comparisons to his predecessor, long-time vocalist Steve Perry, Pineda, like he did in 2009 at Tulsa’s BOK Center, made the night’s vocal lines his own. Possessing a voice similar in tone and power to Perry, Pineda would alter a melody line or change a spot of the vocal timing here and there, but these few side roads never detracted from Journey’s inspired wall of sound. Smith’s drum solo also took charge of everyone’s attention, showcasing the stick-holder’s fluid abilities and impeccable knack for creating and maintaining various rhythms. Smith’s sticks became white-colored blurs as they tapped and smashed into a bed of cymbals and tom heads. It was a rare moment when virtually everyone watched instead of seeking the concession stands. 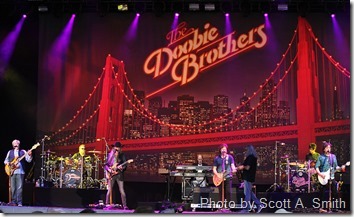 Also summoning emotions from the audience were The Doobie Brothers, who gave an equally muscular set. Opening their slot was a chugging take of “Jesus Is Just Alright,” which was followed by splendid readings of “Black Water,” “China Grove,” “The Doctor,” “Listen to the Music” and “Rollin’ Down the Highway.” The voices of guitarist Tommy Johnston, guitarist Patrick Simmons and bassist John Cowan were peerless, both as stand-alone voices and as harmony parts. For the always-outstanding “Takin’ It to the Streets,” Simmons and Cowan shared lead-vocal duties that were originally handled by departed Doobie member Michael McDonald. Cowan’s bass dug low in register for half of the song, while Cowan’s flexible fingers climbed high on his bass neck for higher notes usually reserved for guitar. Not surprisingly, the concert pulled in a multi-generational army of supporters whose uniforms were dark-colored tour shirts that stretched back to Journey’s 1979 tour. One young individual held up a large, white-colored sign near at the mid-point in Journey’s set. Reading “I’m 17 and I prefer Journey over Bieber,” the sign made Valory’s eyebrows raise and smile widen. Pineda, still singing in mid-verse, also smiled and pointed to the sign. For this writer, not only was the Rogers gig the best Journey, Doobie Brothers and Dave Mason looked and sounded in eons, but the triple bill runs the risk of being the best concert the Walmart AMP has hosted to date.